"My country has beauty but there is an invisible layer of blood caked over everything. Most people cannot see it, but I have special eyes. Everywhere I look, I see red." Opening with a ridiculously low-budget sequence that depicts the horrors of the Bosnian War of the mid-90s, Killing Season quickly jumps into the thick of its plot, wasting very little time. Kovac (Travolta) is a Serbian former solider who survived the conflict only to seek revenge against the Americans who intervened in the conflict and killed his men. One of these men is Benjamin Ford (DeNiro) who has exiled himself in the woods of the Appalachian Mountains. When Ford's car breaks down on his way into town, Kovac appears out of nowhere and offers to help him fix the car. The two men hit it off and become fast friends, or so Ford thinks... The next morning when the men go out for what Ford thinks is some deer hunting, Kovac reveals his true intentions. The film apparently first took shape as Shrapnel, and was supposed to be directed by John McTiernan and star Nicolas Cage instead of DeNiro; But rather than a Face/Off reunion from the director of Die Hard, we get the watered down version, from Mark Steven Johnson, the director of Ghost Rider. For the record, I don't think there's any way to make a good film from this material, but at least with Cage, the film would have been knowingly bad, even a guilty pleasure kind of thing that DeNiro can't quite pull off. It's borderline ridiculous to say something like this, but DeNiro is actually too serious an actor to realize he's playing scenes with obviously unintentional comedy. His early scenes with his co-star are ultimately disappointing because Travolta's ridiculous accent and spray-on hair makes it impossible for me to believe the filmmakers were ever trying to take this film seriously. 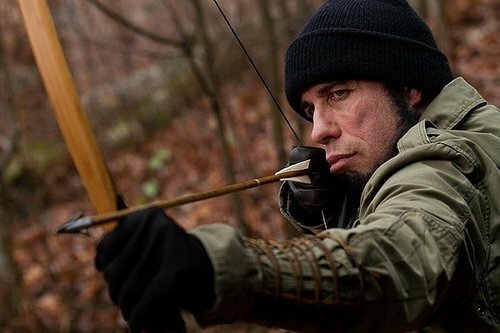 The entire film is pure cinematic nonsense, meaning that having Kovac attempting to hunt Ford with a bow and arrow was done only to prolong his revenge plot to feature film length. Ford even challenges him by saying "why don't you just shoot me," and Kovac's reasons for not doing so are absurd even by film standards. Antagonists like Kovac exist only in the movies because their convoluted revenge plots seem designed to give the default protagonist a chance to gain an upper hand on their enemy. By the time Ford is waterboarding Kovac with homemade lemonade, you'd be forgiven for throwing your hands up in despair and just abandoning the film altogether. This is the kind of film that's not above having close-ups of acclaimed actors with arrows being shot through their calves or cheeks. And please, don't even get me started on the most ridiculous metaphorical deer appearances this side of The Queen. Both Travolta & DeNiro are magnetic screen actors when given proper material, but it almost goes without saying that they weren't given much to work with here. I can't help but marvel at how they even ended up in drivel like this in the first place. Travolta at least was on board when this seemed to be going for something that bordered on farce, and his performance, fortunately, still contains trace elements of that film. 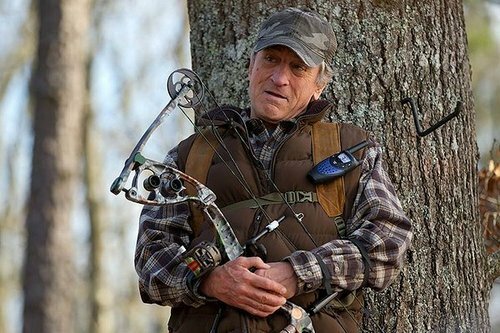 DeNiro on the other hand has almost no reason to appear in a film like this, especially coming off his best work in decades. This sort of thing is right in Nic Cage's paycheck cashing wheelhouse, but DeNiro, while never above appearing in a film for an easy payday, doesn't really seem to even be enjoying himself on screen. It certainly doesn't help that the film's script by Snow White & The Huntsman writer Evan Daugherty, is riddled with plot contrivances and ham fisted dialogue. Ford is mocking Kovac's tendency to talk too much one minute, and then monologuing up a storm himself the next. Things just literally make no sense, such as the constant use of Johnny Cash's "Don't Take Your Guns To Town," which tells me that they either couldn't afford to pay for more than one Cash tune or wanted to get their money's worth after having paid for the rights to that one. 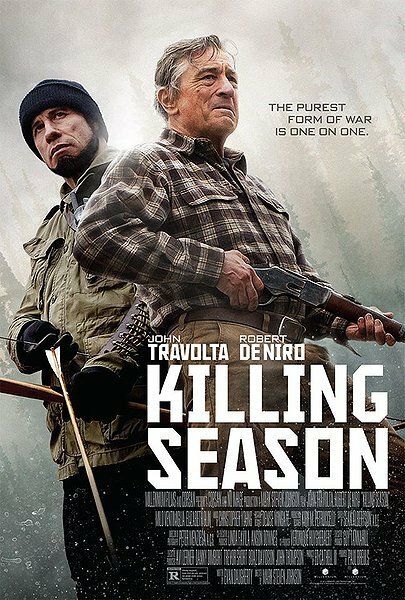 I wish I could tell you that Killing Season is worth your time to see these two cinematic heavyweights go toe-to-toe in grade-A schlock, but it can't settle on a tone long enough to make any of it worthwhile. 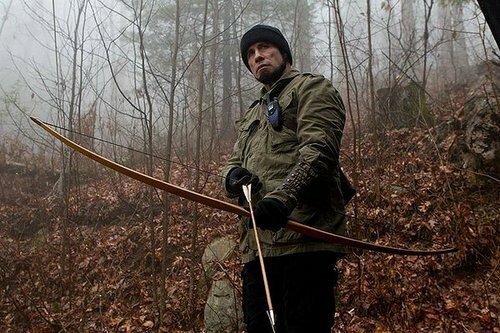 Much like other abandoned Nic Cage projects, we can only lament at the camp classic that could have been, but as it stands now, Killing Season isn't even worth sitting through for fans of DeNiro or Travolta. After about the fifth power reversal, you might begin to think the film will never end, but mercifully it does, just not soon enough. Give this film a wide berth, it's not even worth the dollar and change you could get it for at a Redbox.